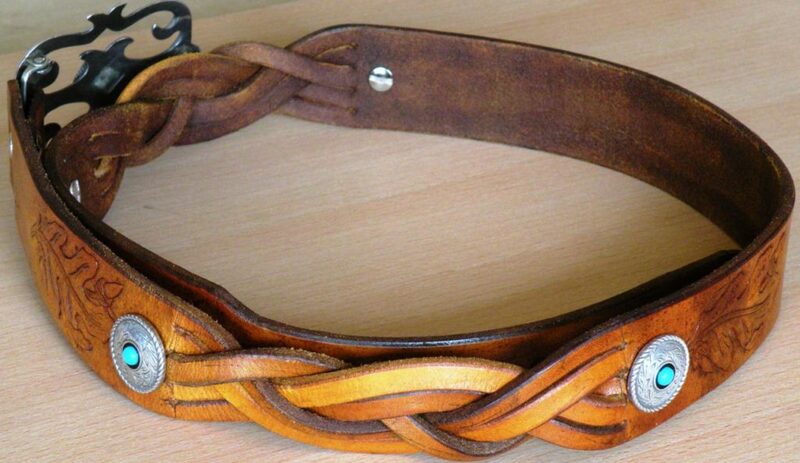 Belts and related items are great for custom leatherwork. I can make any size or style of belt for you. In terms of design, I prefer to start with the buckle you plan to use and design the belt around that. If you have a specific design though, I’m more than willing to work with that. Please see the article below on “How to Measure for a Custom Belt” to ensure that the belt will fit properly. Prices for belts vary depending on the width and length of the belt. 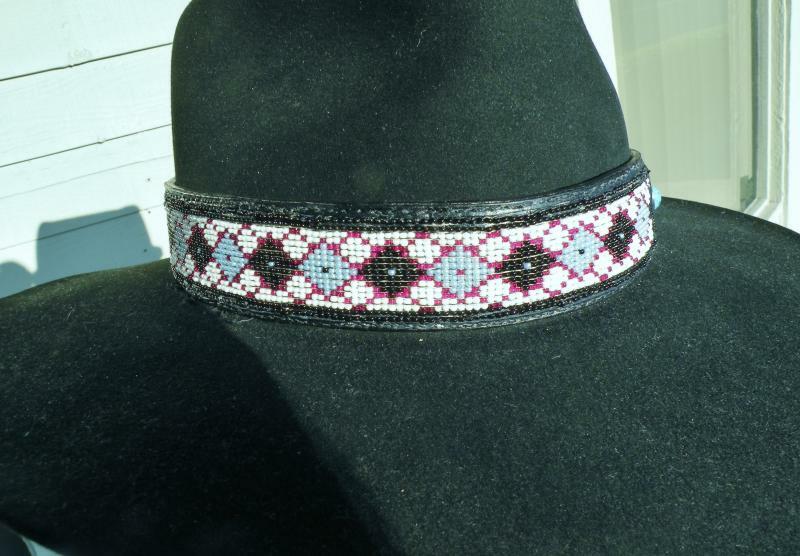 More complex designs, buckstitching, conchos, etc. add to the price. 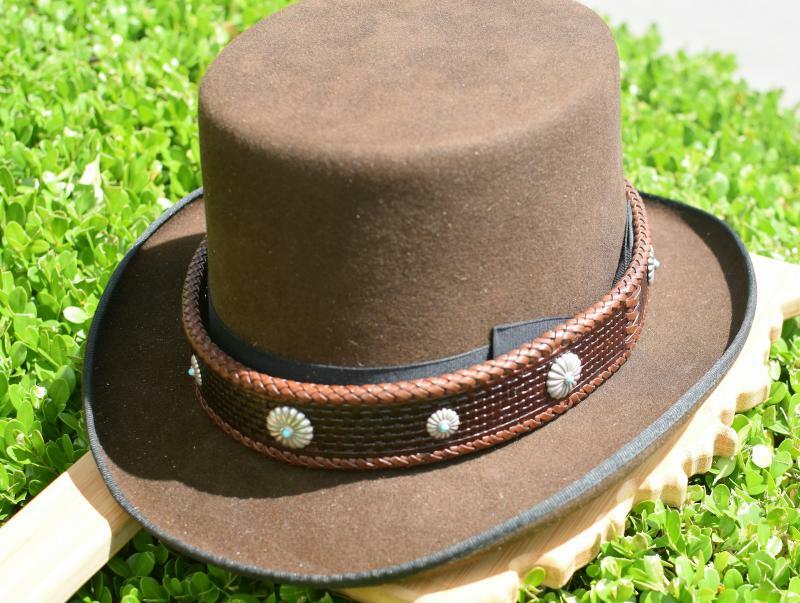 For the cowboy or cowgirl, there’s nothing like a custom hatband to add that special flair to your favorite hat. 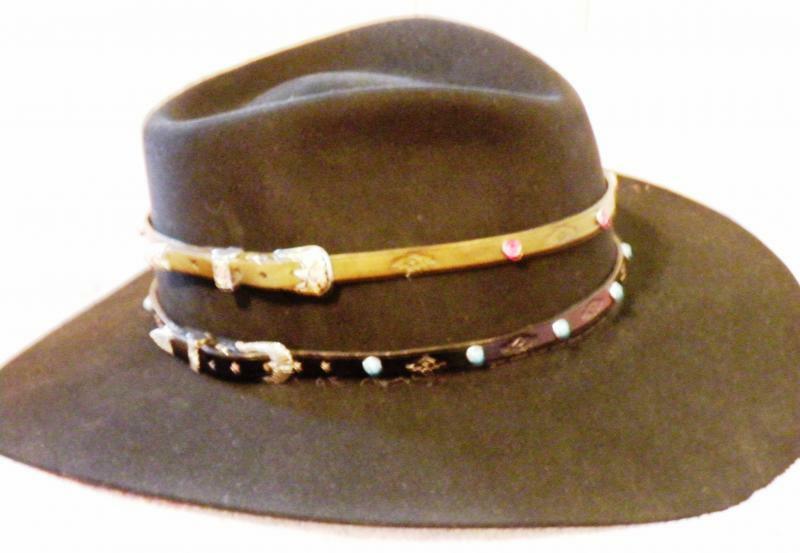 Whether all leather or beaded, hatbands let you express your style! For musicians, custom straps for your instruments add that special feeling and visual appeal (as well as safety) to go with your instrument and music. 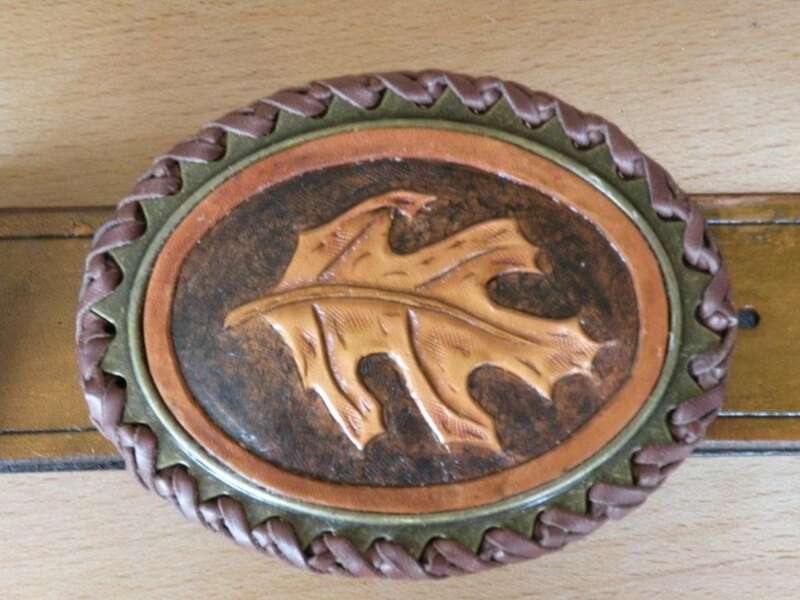 This lined belt has a simple tooled twining leaves pattern. 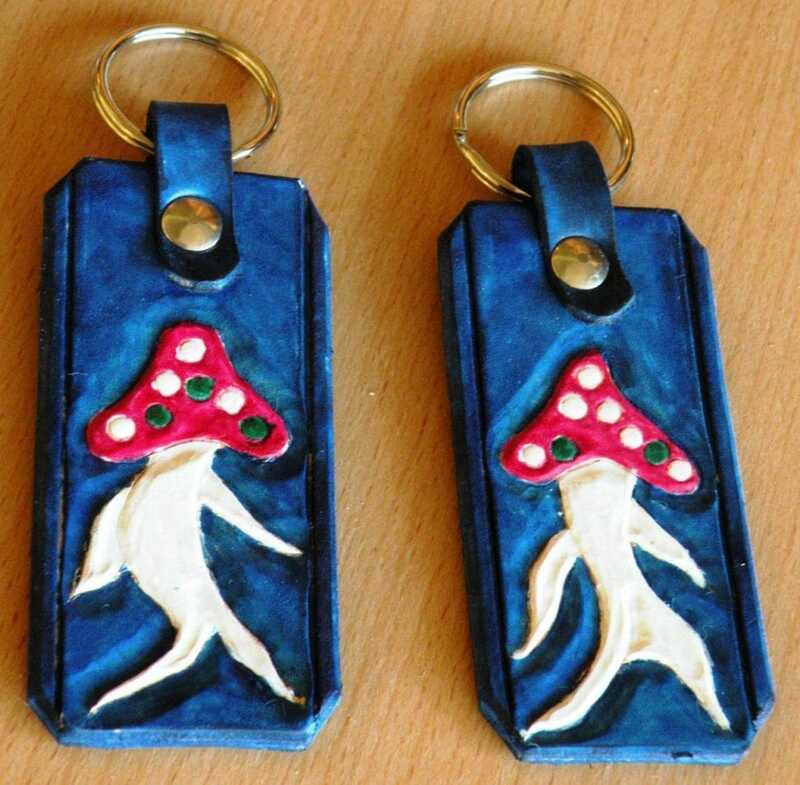 Background is dyed mohogany, then sealed and finished with a mohogany antique. that carry through the appearance of the silver buckle with tourquoise. The use of the black braid with the white center strip means that this belt can be worn with pretty much anything! This design also show one way to deal with the desire for a wider belt when the buckle is narrow…make it in sections. The person for whom this belt was made first picked out the buckle. The skull theme was continued throughout the belt with “ghostrider” stamps and conchos. 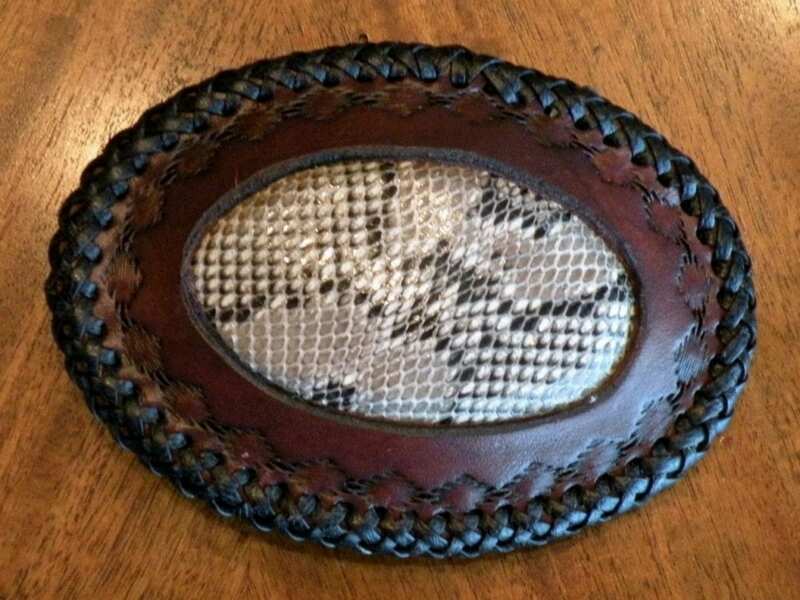 Leather belt buckles can be made to fit the theme or design of a belt, or combined with exotic leathers (such as the python inlay buckle shown here) to add extra pop to your belt. This classy buckle called for a simple design. 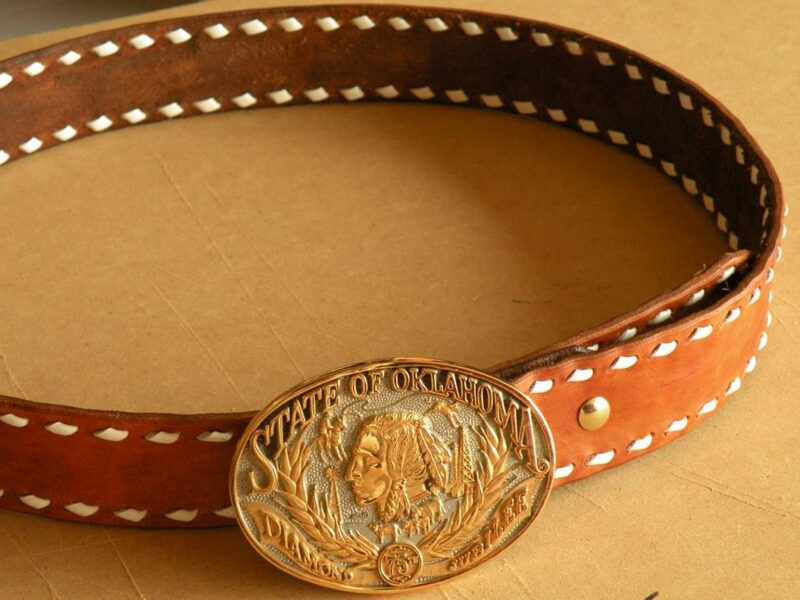 The tan color blends with the buckle and the buckstitching adds class. The backside has the person’s name with very simple tooling to frame it. 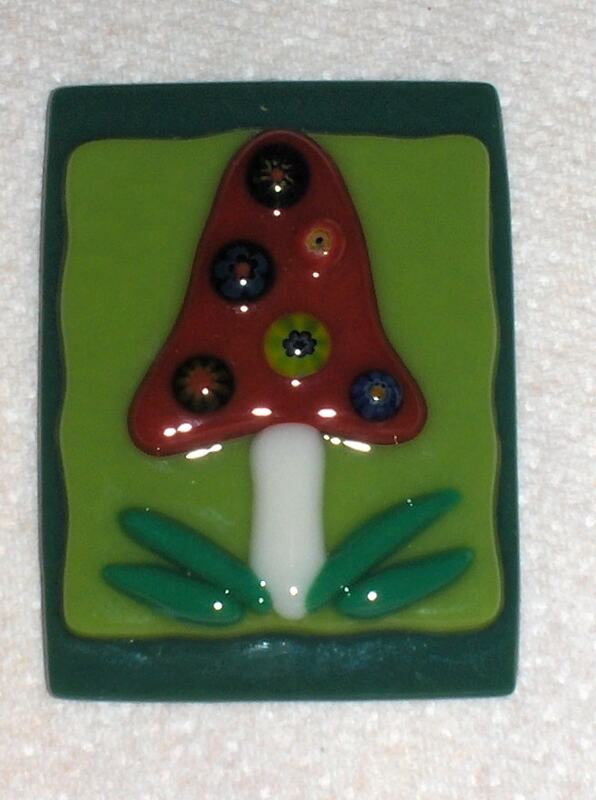 This is a fun example of custom work. A friend designed this glass belt buckle and asked me to make a belt to go with it, along with a key chain. The pictures show the results. The design for this belt was again drawn from the buckle. The tourquoise acceents come from the center stone. 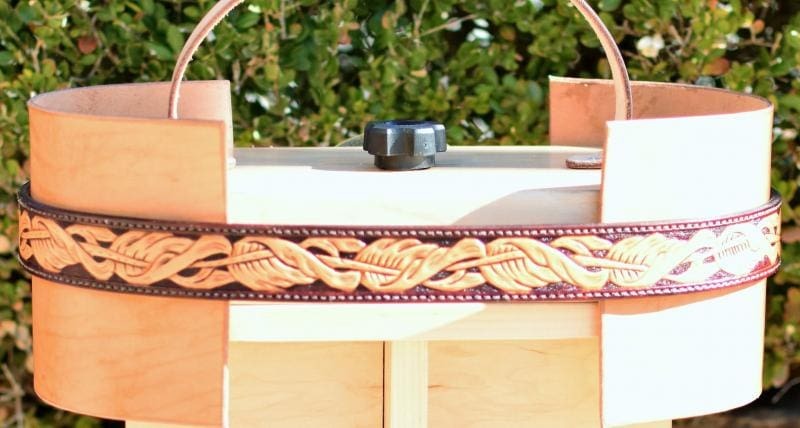 The braids are suggested by the shape of the buckle. The oak leaves…well they just came along for the ride! The braid is known as a “trick braid” since it is made without separating the strands from the main body of the belt. 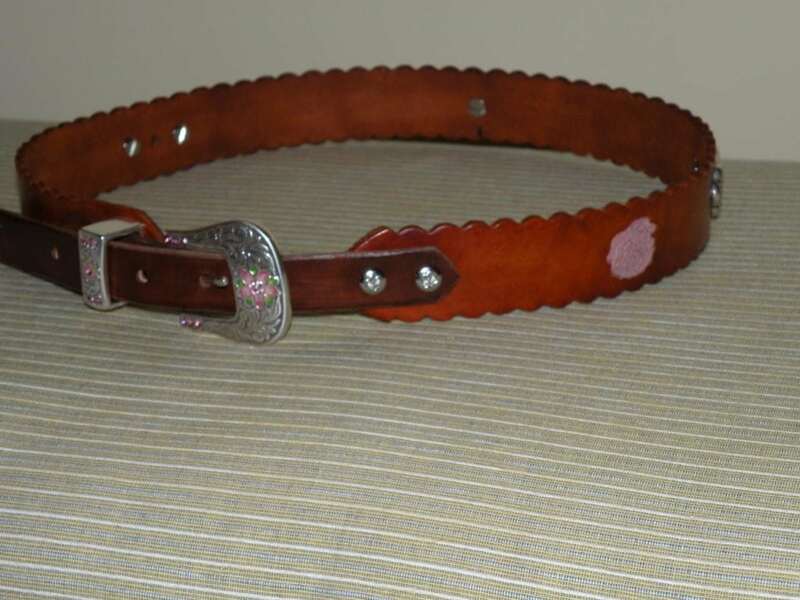 A lady’s belt with small scallopped edges and a pink rose theme throughout the buckle, conchos and tooling. 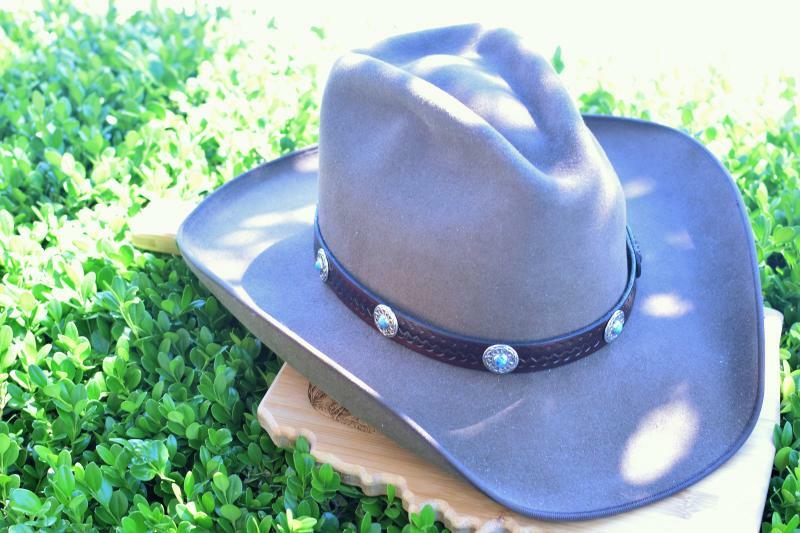 Normally one is enough, but for display purposes this Stetson is sporting two hatbands! Hardware, design and that special “bling” allows you to customize the appearance of your hat. This person wanted their money clip and hatband to match. Basic black and silver with tourquoise accents combined with a Southwestern theme resulted in a classy combination. In this case the money clip is laced rather than sewn. Just waiting for the belt order to complete the set! Spur leathers in multiple patterns, styles, tooling and colors. Two piece, such as those shown here or one piece. 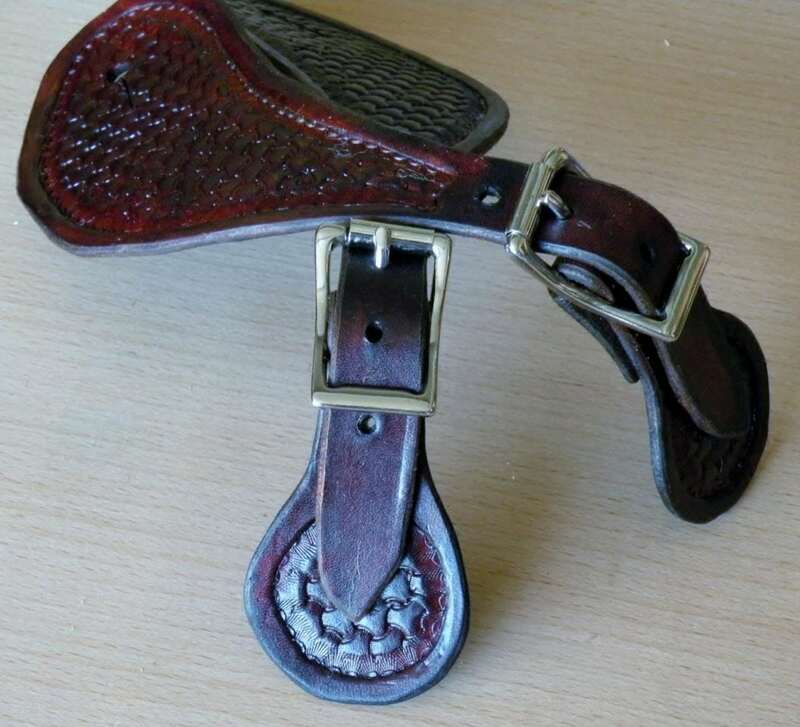 I also make spur straps for the 1911 Cavalry Spurs. Getting a properly fitting custom belt is simple if you provide two sets of key measurements…effective belt length and buckle length and width. 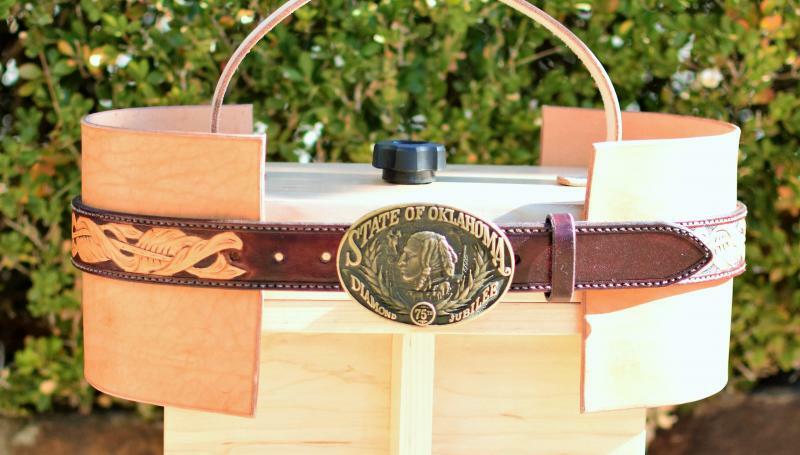 Follow the above link to see how to get the proper measurements for your custom belt. The belt buckle is a vital piece of equipment! Not only does it secure the belt, but it can add style and character and is crucial in determining the size of the belt (as explained in the piece on getting a properly fitting custom belt). I also believe in integrating the buckle design with the design of the belt. If you already have a buckle that you want to use, you can either send it to me or send me a picture and the necessary measurements. If you don’t have a buckle, I’d be happy to get one for you or make a leather covered one for you….based on your preferences. Just contact me to let me know!